The Plum Bayou Garden at Toltec Mounds Archeological State Park. Photograph by Elizabeth Horton, 2016. 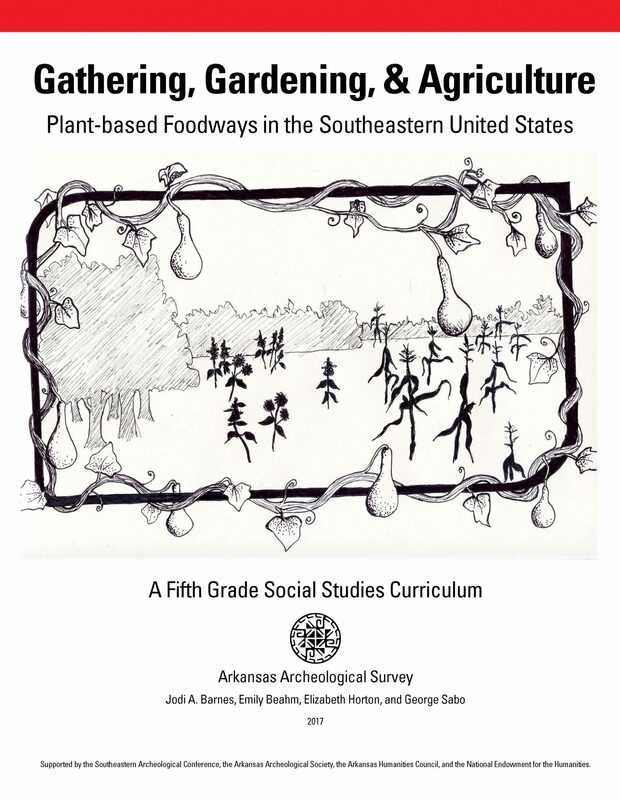 Gathering, Gardening, and Agriculture: Plant-based Foodways in the Southeastern United States is a 5th grade Social Studies curriculum developed by the Arkansas Archeological Survey. Supported by the Arkansas Humanities Council, the National Endowment for the Humanities, the Southeastern Archaeological Conference, and the Arkansas Archeological Society, it is designed to help educators teach students about pre-Columbian societies in Arkansas. The educator and student materials from the Gathering, Gardening, and Agriculture curriculum are included on this web page to help make teaching easier. To request a hard copy of the curriculum, contact Nancy Smith at nms011@uark.edu or (479) 575-3556. The Arkansas Archeological Survey is also offering Teacher Workshops to help educators use this curriculum. Gathering, Gardening, and Agriculture: Plant-based Foodways in the Southeastern United States is aligned with the 5th grade Arkansas Department of Education (ADE) Social Studies Curriculum Framework. It promotes the use of archeology in social studies education in Arkansas’s public schools. Each year, hundreds of 5th grade educators teach their students about pre-Columbian societies and early European exploration in North America (ADE 2014), a period known largely through archeology. Archeology is a scholarly discipline that integrates elements of social studies, humanities, and science to reconstruct and study past human communities. Because of its interdisciplinary nature, many upper elementary and secondary educators find archeology an engaging way to teach social studies, history, and science. This curriculum offers lessons and activities to help teachers and students explore pre-Columbian societies and early European exploration, while highlighting specific sites and events in Arkansas. This curriculum takes a comparative approach to cultural development, while exploring both long- and short-term effects of European colonial influences in the Americas and Arkansas (ADE 2014:H.12.5.1-H.12.5.4). Through this curriculum, students learn key episodes in history, patterns of change through time, and the ways scholars view, construct, and interpret the past (ADE 2014:16). We hope public school educators will use this curriculum to help convey the importance of preserving the past and to generate a more comprehensive understanding of the many ways people have lived in the world. Archeology studies the human past through objects that people made, lost, discarded, or left behind. It is the record of the past and our database for learning about the people, cultures, and environments that came before us. Archeologists regularly employ conceptual tools such as observation, inference, context, evidence, and chronology to study the record of the human past, as do other scientists and historians. These tools make archeology a hands-on and fun way for educators to teach social studies and for students to experience the past. With its comparative perspective, archeology also offers a way to use knowledge about the past to inform the present and future. It provides an effective viewpoint for teaching cultural understanding, because it allows students to compare different cultural perspectives. Even though nearly all humans need the same things to survive — food, water, shelter, and companionship, the ways people meet these basic needs can be very different. By examining the creative ways people met those basic needs, students realize that people are more similar than they are different. Archeology is a way to help students see their ancestors in a very human way. Archeologists, like historians, are interested in change over time. Archeology is one of the few ways to learn about people who left no written records. In North America, this is 97 percent of human occupation and for the rest of the world the percentage is even higher. Archeology and history have similar goals. Both seek to reconstruct and understand the human past. Archeology uses material evidence such as artifacts, buildings, stone walls, fire hearths, butchered animal bones, and charred seeds to reconstruct the past. By looking at changes in the material evidence, like stone tools or plant remains, archeologists can identify both continuity and innovation over time. In addition, archeologists working on more recent sites often borrow from history to use written evidence such as letters and public documents. When used together these sources complement one another and teach students how to think critically and construct a more detailed picture of the past. Plants are the backbone of life on Earth. They are essential for human life and are integrally related to air, water, and climate. Plants are vital to our everyday lives. They are the foundation for diverse habitats. They are an important part of a nutritious diet. Archeologically, plants provide a lens into past social and cultural changes. People have a long and complicated history of plant use. Plants are and have been vital to people for food, for medicine, as a raw material resource for building homes or boats, and for making tools. As critical parts of our foodways, plants not only fulfill nutrient needs, they teach us about culture, history, and economics. Biologically, people need food to survive, but what we eat is part of our history and culture. In fact, plants have been so important that we often forget how much of our lives and our history are based in plants. 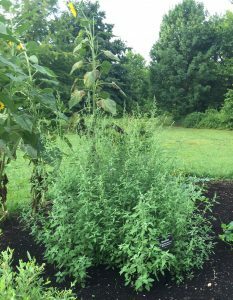 There is another reason why the ancient use of plants is such an important part of Arkansas history. Arkansas, along with the surrounding mid-South region, is one of only ten world centers of independent crop domestication. Preserved plant remains excavated from dry bluff shelters in the Arkansas Ozarks (and now curated at the University of Arkansas) represent most of the evidence supporting this identification. This curriculum is designed in part to celebrate this important aspect of our past. 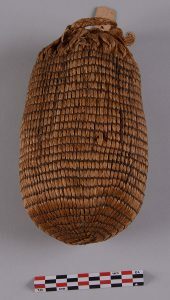 This woven bag made from rattlesnake master leaves and pawpaw bark was recovered from a bluff shelter in Benton County in the 1930s. There were thousands of seeds from a domesticated version of the goosefoot plant inside the bag. Radiocarbon dating of the seeds shows that Arkansas Indians were growing, tending, and harvesting this now extinct crop at AD 20. Photograph by David Dye, 2015. Although the domesticated version of the goosefoot plant, like the seeds carefully collected and stored at AD 20 in the woven bag (to the left), is extinct, today you can see its wild relative growing in the Plum Bayou Garden at Toltec Mounds Archeological State Park. Photograph by Elizabeth Horton, 2016. The Survey's mission is to study Arkansas's past, to preserve and manage information about archeological sites, and to share what we learn with the people of Arkansas. We invite members of the public to help discover and record information about archeological sites in Arkansas.